So Uh…What Exactly Is A Duvet Cover And Why Should I Get One? 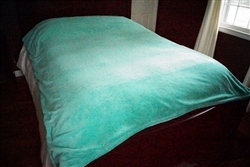 A duvet cover for college can make a great addition to your Twin XL dorm bedding supplies. Since you probably have a dorm comforter, a duvet cover is simply a cover that encases the comforter and keeps it protected from wear and from getting dirty. A duvet (pronounced “doo-vay”) cover is most commonly applied to down comforters, however, it can add an extra layer of softness to any college comforter! Down comforters for college are truly top-of-the-line dorm bedding supplies. They’re filled with either goose or duck down, which is a truly warm and quality material. (The down is encased in cotton, so, no, you won’t be lying in a bed of feathers.) Down comforters are exceptionally warm and cozy—after all, feathers are what keeps ducks and geese warm out there in the wild! Down comforters, however, should not be placed in the washing machine. While most other dorm comforters are machine washable, that is one of the down comforter’s major drawbacks. But that’s what duvet covers are for! Wrap that down comforter in a nice, soft duvet cover, and you won’t have to worry about it getting dirty. Duvet covers are machine washable, fortunately. They also come in a variety of pretty and colorful hues; down comforters are traditionally white, so adding a nice xl twin duvet cover will bring much-needed color. Be sure to check out DormCo’s 100% cotton duvet covers and the super soft coral fleece duvet covers. Don’t just think of a duvet cover for college as adding a protective layer to your dorm comforter; think of it as adding yet another layer of warmth and softness! As mentioned, you can wrap a duvet cover around any of DormCo’s XL Twin comforters; they’re not limited for use with only down comforters. After all, why not keep that favorite college comforter protected from getting dirty? Or, if you get bored with the color or design of your twin xl comforter, a duvet cover can bring a refreshing new hue while sealing in all that same comfort.